A sediment filter is not a water purification system, it is usually installed at the water feed line to your house, it consists of a pleated paper or spun fiber filter that fits inside a housing. It removes sediment and suspended solids rust and particles. The label should have a size rating like a 5-micron filtration, which means it will filter particles down to 5 microns. These filters are inexpensive and easy to replace, a water shut off valve is usually installed just before the filter. Turn off water then just unscrew the canister remove the old filter clean, check the O-ring seal and pop in a new filter. Screw back on and check for leaks. Charcoal filters can be used alone or in combination with other filtration and purification systems. Charcoal has been around for hundreds of years and is very good at what it does, one pound of granulated charcoal if spread out will cover an area the size of 120 acres. 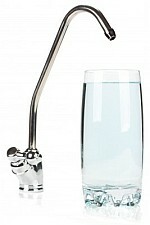 This gives the water a large surface area to travel through, removing certain impurities and improving taste. The activated part is the charcoal is exposed to high temperatures and steam in the absence of oxygen. Vegetable charcoal is usually made from coconut hulls and is the most common in use today. A simple charcoal filter can be easily installed at your kitchen faucet; it is a good policy to check the cost of replacement cartridges and how often to replace before you buy. Carbon block filters are very similar to charcoal filters and can be mounted under the sink or even on the counter top near your faucet, they contain large amounts of charcoal tightly packed into a small area. They have a sophisticated honeycomb design allowing the water to stay in contact with the charcoal for longer periods of time filtering out more impurities. Ceramic filters are made from diatomaceous earth like volcanic sand or magnetite stone. They were designed in England to prevent cholera, dysentery, giardia, cysts, e-coli and cryptosporidium. Inside the ceramic are microscopic pores that trap bacteria down to 0,2-0.5 microns, which is considered bacteria free. Ceramic filters are washable and can last up to 3,000 gallons. Like charcoal they are usually used in combination with other filtration systems. A reverse osmosis water purification system is widely used and is familiar to most people. They consist of a sediment pre-filter, a semi permeable membrane and carbon post filter. They are usually mounted under the kitchen sink and need a cold water line connected to it and a waste line connected to the sewer line. A pressurized 2 or 3-gallon storage bottle sits next to it. Reverse osmosis water purification systems use a lot of water, it takes about 4-6 gallons of water to make 1 gallon of clean water. RO systems filter out a wide range of impurities as long as the filters are changed at their scheduled time. It is advisable to check the cost of the filters and how often to change them, the semi permeable membrane can be a costly item to replace. Water purification systems are good if you live in an area where your have hard water, a water softener will do a good job of reducing calcium and magnesium to soften water. Your water heater will last longer and your bathtub will stay cleaner, it will feel much better on your skin and your soap will lather easily. Water softeners usually add salt to alternate back flushing their 2 tanks and can raise the sodium level in your water. It is not advisable to drink softened water. There are salt free systems on the market; you should have your water quality checked to make sure they will work to your satisfaction. KDF shower head water purification systems are a very inexpensive item usually under $100.00 and should definitely be installed on your shower head. It will remove almost all chlorine and reduce iron, lead, mercury and hydrogen sulfide it also prohibits bacterial, fungal and mildew growth. The replacement filters last about 1 year and are inexpensive usually under $50.00. Ultraviolet lamps are used as water purification systems, they produce short wavelengths of light that kill bacteria, viruses and other microorganisms. Water enters the UV purifier and under the light, it usually only takes seconds to kill microorganisms. You do not want too fast of a flow rate as it may not completely sterilize the water. It is best used in combination with other purification systems. The UV lamp is long lasting approx 7,000 hours and uses very little energy 10-60 watts. Ozone is a powerful germicide and is used in water purification systems it has been found to be more effective at killing e-coli bacteria than chlorine; it is also effective against organisms like cysts, viruses, amoebae and most spores. It also oxidizes THMs, chlorine and pesticides. Many European countries now use ozone as their water purification Systems in their municipal water supplies. Ozone does not have a lot of the negative effects that chlorine has. It is also now being used in air purification. 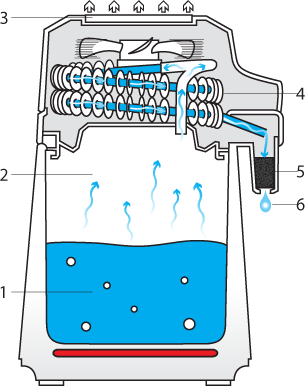 A home steam-distilled water machine is the crown jewel of water purification; it removes 99% impurities with a charcoal filter, from your water. It is easy and simple to use and just plugs into an electrical outlet. Fill the 1 gallon boiler with tap water, hit the power switch and in about 2-4 hours you will have a gallon of the purest water you can drink. The charcoal filter needs to be replaced every 2 months and is easier than unscrewing a bottle cap and costs less than $50.00 for a 1 year supply of filters. It is as close as you can get to natures way of purifying water. Good as a pre-filter in combination with other filters. Easy to replace filter. May need plumber to install with shut off valve. Improves taste, removes Volatile organic compounds (VOCs) Trihalomethanes (THMs) Pesticides, MTBE (used in gasoline and is now banned) Herbicides, Chlorine, Chloramine, Bromoform, and Benzene. Used in combination with other filters. Bacteria growth if filter not replaced on schedule. Not recommended to use in hot water. All Bacteria down to 0.2-0.5 microns effectively sterilizing the water. 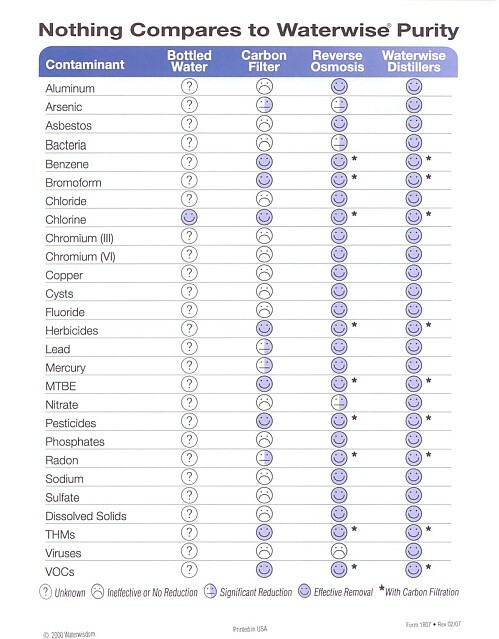 Will not remove viruses, dissolved solids, fluorides, nitrates and heavy metals. With charcoal filter will remove almost all impurities. Membrane expensive to replace. Cost and time to replace filters and clean system on schedule. Less effective with each gallon filtered. Will not remove all impurities. Uses 4-6 gallon to make 1 gallon. Very little maintenance, salt inexpensive, softens hard water, soap lathers easy, better for skin and hair, water heaters last longer, plumbing will have less scale build up, bathtub stays cleaner. Generally improves quality of your water. Needs plumber to install. Can be noisy in back flush cycle. Some cities have banned water softeners due to high concentration of waste into sewer system. Easy to install, removes Chlorine, reduces iron, lead, mercury, hydrogen sulfide and prohibits bacterial, fungal and mildew growth. Inexpensive, yearly filter replacement easy and inexpensive. Kills Bacteria, Viruses and other microorganisms to sterilize water. Will only remove bacteria, viruses and microorganisms. Works more effectively than chlorine, kills bacteria and hard to kill pathogenic organisms, Improves odors, tastes and color. Oxidizes THMs, chlorine and pesticides, precipitates heavy metals asbestos, fluoride and nitrates. Helps aquatic life when it changes back to oxygen. Has potential for air purification. Will not remove all impurities. Removes 99% impurities with charcoal filter, many health Benefits, easy to use, inexpensive and simple filter replacement. Clearly steam-distilled water is head and shoulders above the many other systems available today.